The soup-to-nuts guide on all things SQL! SQL, or structured query language , is the international standard language for creating and maintaining relational databases. It is the basis of all major databases in use today and is essential for the storage and retrieval of database information. 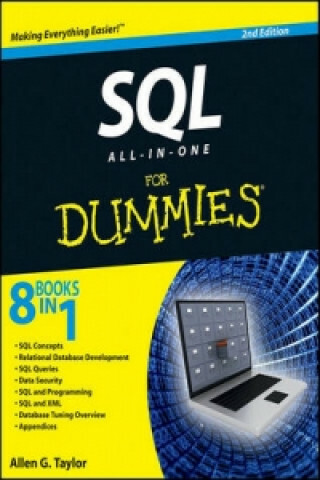 This fun and friendly guide takes SQL and all its related topics and breaks it down into easily digestible pieces for you to understand. You'll get the goods on relational database design, development, and maintenance, enabling you to start working with SQL right away! Provides an overview of the SQL language and examines how it is integral for the storage and retrieval of database information Includes updates to SQL standards as well as any new features Explores SQL concepts, relational database development, SQL queries, data security, database tuning, and more Addresses the relationship between SQL and programming as well as SQL and XML If you're looking for an up-to-date sequel to the bestelling first edition of SQL All-in-One For Dummies, then this is the book for you!